Is obsession always wrong? Where does it cross the line to true love? 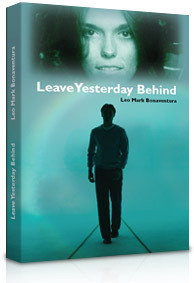 In Leo Bonaventura’s Leave Yesterday Behind, billionaire Leo Adam Alba meets his obsession in a dream. She is a beautiful dark haired woman who pleads with God to help her fight off her demons. These are the demons of anorexia and depression, caused by the desperate feeling that life and true love is passing her by. When he learns that the dark haired woman is the singer Karen Carpenter, one half of the brother-sister singing duo The Carpenters, who had died in 1983, he decides to challenge physics and find a way to go back in time. His quest is epic in scope: to find her, make her fall in love with him and before she dies again, bring her back to his time in the present. While the science used to go back in time is fascinating in itself, the real story is the love affair he has with Karen Carpenter and the ultra idyllic life they live together. That is until it is time to tell her the truth about himself and his plans to take her and their child, back to the future. Can love really conquer all? Is it truly eternal? Does it transcend time? This star-crossed, sizzling romance dares to find out. Copyright © 2009 Leo Mark Bonaventura. Cassis.